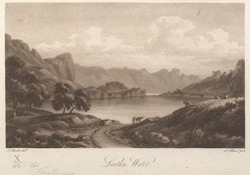 View of Leathes Water in Cumbria, Northern England, which now makes up part of Thirlmere Lake. During the late 19th century the demand for water trebled in Manchester and the surrounding area and the local authorities decided to make use of the natural resources in the Lake District. Thirlmere Lake and Leathes Waters were merged and a large dam was built by the Manchester Corporation Waterworks Company. The landscape of the area was completely transformed; the water level rose by 50 feet and the villages of Wythburn and Armboth were lost.